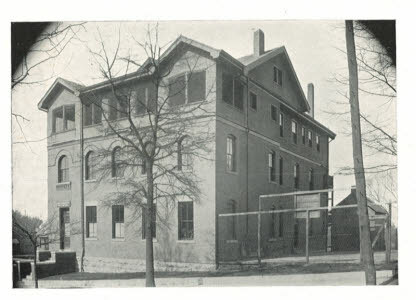 The old GPS school building as it looked in 1915-16 when the school began occupying it. 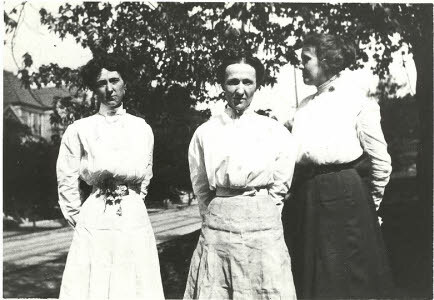 GPS founders, from left, Tommie Duffy, Grace McCallie and Eula Jarnagin as they looked in 1910, five years before moving to Palmetto Street. One hundred years ago this fall, Girls Preparatory School moved to Palmetto Street in downtown Chattanooga. The then-9-year-old independent girls school was relocating to the former Baylor School facility that it had purchased for $1,000 when Baylor moved to its spacious new grounds along the Tennessee River at the foot of Signal Mountain. Baylor had built the four-story Palmetto Street building – the first constructed for an independent school in Chattanooga -- on a small lot between Oak and Vine streets in 1899. But within a few years, Baylor realized the structure did not adequately meet its needs – primarily because the school after 1905 had to compete against McCallie and its spacious campus at the foot of Missionary Ridge. For GPS, however, this building located three blocks east of their previous building in founder Grace McCallie’s former Oak Street home proved to be an ideal fit, at least for about three decades. It was not new, but within its walls the school was able to expand greatly Chattanooga’s still-new concept of providing a quality independent education for girls. Although GPS moved to its current location north of the river in 1947 and the old Palmetto Street facility is no longer there, memories of the old building still remain in the minds of a few alumnae, now all in their 80s and older. At the time that GPS moved into the Palmetto Street building in 1915, it had such nearby neighbors as old-fashioned grocery stores, a boarding house and a number of single-family residents. One of the nicer nearby homes was the old Lyerly home across Palmetto Street, then resided in by Z.C. “Bome” Patten. The University of Chattanooga was still a block or two west. According to the school’s yearbook, the Kaleidoscope, teachers at GPS that first year at the new location included headmistress Tommie Duffy, who taught history and French; Laura Elmore, who taught chemistry; headmistress Eula Jarnagin, who taught Latin; headmistress Grace McCallie, who taught math and English; Gertrude Oehmig, who taught the 7th and 8th grade students; Ruth Perry, who taught math and German; and Chloe Thompson, who taught English. Miss McCallie, who would die unexpectedly in 1918, lived in the top floor apartment of the Palmetto Building along with Misses Duffy and Jarnagin. This was the same apartment where Baylor Professor John Roy Baylor and his family had resided. Ms. Elmore lived at 513 Pine St., Ms. Oehmig at 416 E. 5th St., Ms. Perry at 1411 S. Holly St., and Ms. Thompson at 404 E. 2nd Street, all within a few blocks of the school. The school that first year at its new location had eight seniors – Dorothy Peak Aull, May Louise Beckham, Ida Callaway, Ruth Hooper Dayton, Isabel Griscom, Louella Smith, Sarah Stansell and Mamie Gardenhire. It also had two other seniors it called irregular students – Katherine Clinton Conn and Marie Warwick. According to the 2006 school history written by Patrice Glass, irregulars initially were students who did not take college preparatory classes. Later the term was used to describe students who had not taken appropriate coursework, such as Latin, before they entered the school. They were expected to catch up at summer school or by adding additional courses. 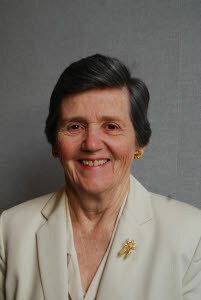 According to Ms. Holland and Ms. Cate, that term was typical of the demanding and straightforward atmosphere of GPS when they attended the school in the 1940s. Mrs. Cate, who was four grades behind Ms. Holland, had similar memories. Despite the challenges, or maybe because of them, both Ms. Holland and Ms. Cate said they greatly cherish their GPS education. According to the two, the Palmetto school building – the architect of which seems lost to time – had four floors. In the basement were the students’ cafeteria, a small restroom facility and a furnace room. The first floor had two classrooms and an assembly room/study hall, with bookshelves on the wall creating a makeshift library. The second floor included six classrooms and a chemistry lab, while the third – or top – floor was the apartment where Misses Duffy and Jarnagin lived during the school year. It included a front screen porch facing Palmetto Street. One perk to teaching at GPS was that all the teachers were able to go up to their apartment and sit together for a lunch prepared by a black cook known as Ms. Mamie, Ms. Holland recalled. The time would be devoted to consuming information about the day as much as consuming food. If one student had misbehaved or not done well academically in a teacher’s class in the morning, the student would hear about it from an afternoon teacher. Ms. Holland recalled that while Miss Duffy and Miss Jarnagin were co-headmistresses, Miss Duffy seemed to be more in charge. Ms. Cate believes her background prepared her perfectly for running a school. “Miss Duffy had raised two little brothers. Her mother had died when she was young. So she knew how to be tough,” she said. However, Ms. Cate was quick to add that Miss Duffy was very fair and that both she and Ms. Jarnagin had the full respect of the students. The academics were also challenging, they remembered. Ms. Holland said that when she transferred into GPS from Bradley Central as a sophomore, she really struggled in algebra. Ms. Holland said she needed an 82 during the second semester to pass and worked hard and made an 84 and felt proud. All the academic hard work did help her when she went off to Sophie Newcomb College in New Orleans, which is now part of Tulane University, she added. Ms. Cate, who went to Mount Vernon College for Women (now part of George Washington University), remembered such teachers as Ms. Ulrica Whitaker and her sister, Ms. Roxie Lawwill. “They had different personalities but everybody liked both of them,” she said. Ms. Whitaker had a seemingly three-foot-long pencil, she recalled, and used it for everything from pointing out an important point on the blackboard to getting students’ attention. The school also had an early male teacher named Dudley Wiley, who would teach penmanship on a part-time basis late in the day. “You needed to have a pen full of ink,” Ms. Cate said. “People would forget to put ink in their pen, and you would squirt ink of out your pen into their pen” (because students were not allowed to get up and fill theirs with ink). That class also had homework, and the students were required to take it up to Miss Duffy’s office at the top of the steps on the second floor and put it in a basket on top of the radiator. Among the other memories the two had of those years are of limited transportation to and from the school. 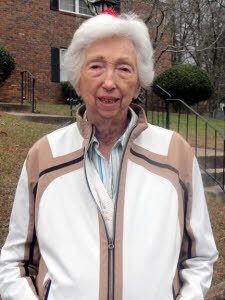 Ms. Cate remembered that maybe only two seniors had cars by the time she was a senior in 1948-1949, after the school had moved to the North Chattanooga campus. Other memories of the old building are of the unsophisticated lockers that were basically only hooks for hanging coats or gym bags. The quicker your parents paid your tuition, the closer your spot was to the front door that school year, Ms. Cate said. There were also two hooks in the study hall, and one was for a student to put a piece of paper with her name when she went to the bathroom, and the other one was for the student to get a drink of water. A student could go out only when a hook was empty, thus keeping several students from being gone at once. The students were also assigned a desk somewhere in the school building to keep their schoolbooks and notebooks, the two said. It was a definite no-no to set your books down on the floor somewhere on your way to lunch, rather than taking them to your desk. “Miss Jarnagin would come down the steps and start kicking books,” recalled Ms. Cate with a laugh. There was a little other mischief performed by the students, from deciding to drop their books in study hall at a certain time to occasionally sneaking out and smoking cigarettes out of sight. Of course, some of the teachers, who had hawk eyes, would spot them from an upper floor window. Afternoon meetings with Miss Duffy were the punishment. The school also devoted plenty of time to spiritual direction. Miss Jarnagin made the students learn a Bible verse each day, and would also offer a prayer. The traditional GPS activity of May Day was well under way by that time, and it was held at the University of Chattanooga quadrangle along McCallie Avenue during the later years at the Palmetto Street location. The equally traditional GPS dress was also already in use, with students’ mothers getting local seamstresses to make theirs. Ms. Cate said her dresses were made by Mrs. Guy Tribble. Basketball was also a part of the school in the 1940s, as the school practiced in the small building adjacent to the school. Competition included such teams as North Avenue Presbyterian Girls School in Atlanta (the predecessor to Westminster School) and Hutchison School from Memphis. When Ms. Holland graduated in 1945, Miss Duffy and Miss Jarnagin also retired. Miss Duffy would die two years later in 1947, while Miss Jarnagin lived until 1962 – 44 years after her friend and colleague Miss McCallie died. Ms. Cate said that when the school moved to the North Chattanooga location in 1947 for her final two years, and apparently also moved some of the old metal frame desks, it actually had only one building – the current Senior School. So the new facility was initially not that much bigger than the old school, she said, even though it had more campus space. Also, the cafeteria was not completed until several weeks after the move, so the students were served sandwich lunches in bags initially, she added. As far as the old school building on Palmetto Street, old Chattanooga city directories on file at the library reveal that it almost immediately began serving as the home of offices and meeting space for several local union groups. They included the American Federation of Hosiery Workers, the local Congress of Industrial Organizations, the Steelworkers of America, the United Brewery and Soft Drink Workers, and the Industrial Union Council. A later group was the Oil, Chemical and Atomic Workers. And for a number of years, CIO Union Center custodian Ellis Zack Smotherman lived in the apartment where Professor Baylor and his family and later the three founders of GPS resided. A neighbor across Palmetto Street during this time was the Rev. Thorne Sparkman, rector at St. Paul’s Episcopal Church. UTC art and architecture professor Dr. Gavin Townsend, whose office is not far from the former site of the old building, called the GPS/Baylor building one that tried to fit in architecturally with the Victorian homes built around it. “For the foundation, or at least the facing of the foundation, the building used the same rough sandstone blocks that are common to the Fort Wood neighborhood,” he said. “The windows piercing the brick walls, presumably brick load-bearing walls, are large, as befits a school building. Despite the building’s nice architecture and its three distinct lives covering more than 70 years, its end eventually came. The CIO Union Center and other tenants moved out to 2402 Amnicola Highway in the early 1970s, and the building sat vacant for about six years. At some point UTC bought the property and then tore down the building shortly before beginning construction on the UTC Fine Arts Center in the general area. Groundbreaking for the Fine Arts Center occurred in early 1978 – which was also the year that union custodian Mr. Smotherman died – and the building opened in 1980. Today, GPS has a much larger campus than the one that opened in 1947 in North Chattanooga and the even smaller structure left behind on Palmetto Street. The latter may have become confining physically, but inside it walls young women of the first half of the 20th century had opportunities to expand their academic and career horizons. Decades before mainstream society was, GPS was challenging young women to be all they could be. “I loved GPS,” said Ms. Cate.